The Union of Islamic World Students, an international Iranian government sponsored student group, released pictures on its website of the Asian delegation of the Global March to Jerusalem’s (GMJ) visit to Tehran last week. The delegation left Indonesia on March 10 and plans to cross Israel’s borders and enter Jerusalem on March 30. The Asian delegation met with the president of the Iranian parliament, Ali Larijani, and the Iranian President Mahmoud Ahmadinejad during its visit. GMJ members use images of Israeli officials with crosshairs superimposed over their faces as dartboards. 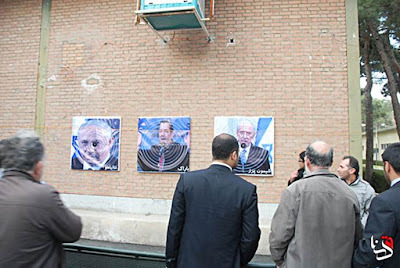 Officials included Prime Minister Benjamin Netanyahu, Defense Minister Ehud Barak and President Shimon Peres. 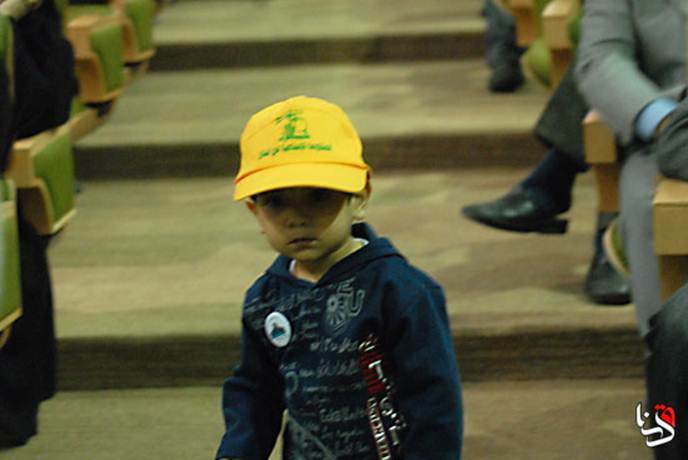 A child wearing a Hezbollah cap at a reception for the GMJ delegation at the former U.S. embassy building.